I’ve recently found a copy of the book I mention below, and have been playing around with the ideas in this essay for a while. Reading essays of a similar nature by John Langan, Laird Barron, and Megan Abbott (here and here) nudged me to sit down and do it. A long time ago (nearly half a century past), in a galaxy far, far away (okay, maybe not so far away), I had a book. I say “had” because I know I didn’t buy it and I don’t remember who gave it to me. 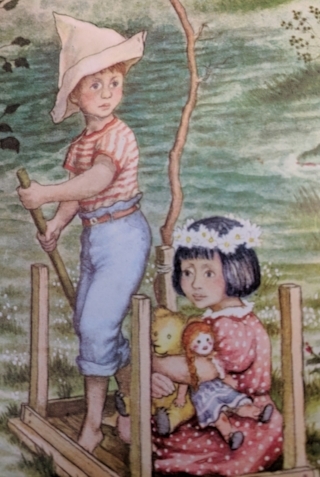 The Tall Book of Make-Believe (selected by Jane Werner, illustrations by Garth Watson) still haunts me, so much, that I recently conducted a search to find a copy and see if it still freaked me out the same way it did when I was a kid. Let’s start with the cover. The children’s faces remind me of the kids on the planet Camazotz, in Madeleine L’Engle’s A Wrinkle in Time. Blank, unblinking eyes, zero facial affect, ostensibly playing but going...nowhere. It’s supposed, I think, to look whimsical and engaging, but I found it chilling. Creepy. Unsettling. The stories...the stories. The book wasn’t meant to be a horror collection—it’s aiming for imaginative or silly—but I was obsessed with it. I read the stories over and over again, because I wanted to know if they would still be as alarming the next time. I understand I was reading into the stories, filling in blanks on my own, or inserting my own dark imagination, but they certainly left a mark. I soon became addicted to fairy tales of all sorts. Encountered the darker, older versions of the Grimms’ stories, and then omnivorously devoured mythology. Every culture had monsters, untrustworthy creatures, dangerous beings. There were sides to fairy tales grown-ups didn’t talk about and that Disney didn’t bother to mention. Didn’t we need to know about these hidden, dark worlds? Why weren’t we being prepared for this? If “Buffy the Vampire Slayer” had been around then, I would have trained as a Slayer, just in case. All of this reading eventually confirmed something for me: Every story has monsters. That led to a lot of confusion as I grew up. Why were some tales with monsters okay, and some not? Shakespeare, Homer, the Bible, Poe, Shelley = good. Lovecraft, Tolkien, King = bad (though these divisions are radically different these days, they persist). What made the difference between “trash” and “classic?” Why was mythology important to study, whereas The Gigantic Book of Real Ghost Stories or Strange True Tales of Vampires (or whatever) would rot your mind? More confusing to me still was that I knew it wasn’t just the books with a gory cover and a vampire or sea-monster on it: There were human monsters, too. All the aforementioned, and all the other canonical “classics” had monsters, to my mind. Oliver Twist—monsters who steal and abuse children “for their own good.” The Witch of Blackbird Pond—monsters of ignorance and superstition. Monsters existed in non-fiction, too. The Diary of Anne Frank left me cold for hours after, as of course it should, and so did a lot of history and memoirs. Sometimes the monsters look like us. Sometimes the monsters are within us, a personal fight for self with an intangible enemy. Crime fiction was the next link for me, I think. It gave me insight into identifying monsters, as well as the notion that they could be vanquished, within or without the law. The more I write crime fiction, the more I write noir, which is, to me, a genre filled with human monsters and no good choices for those who face them. Tied a white ribbon around him so the owl could find him! Writing horror—like any genre fiction—allows a writer to talk about big subjects in a safe, abstract way, while still conveying the terrible emotions involved. Writing horror lets me explore how to overcome my monsters or at least, survive them—an inoculation, if you will—and it lets me explore what happens when the worst comes to pass and the monster wins. Writing horror lets me be the monster. I’ve discovered how very satisfying that can be. It’s a whole new perspective on the world, and some days...tempting. Given my response to a mild dose of the macabre as a kid, I’ve surprised myself by writing horror as an adult, and now, I know why. Because sometimes when the world seems more than usually terrible, we need to deconstruct what’s haunting us and from that, learn how to defeat that which we find monstrous.